Prayer is the foundation of all that we do in defense of human life. Therefore, prayer — our communion with Almighty God — infuses every aspect of our efforts: every project, every event, and every individual. The CPLC provides many opportunities for individual and communal prayer on behalf of life: the annual Roe v. Wade Memorial Rosary and Mass; 40 Days for Life-Dallas Vigil; Pro-Life Stations of the Cross on Good Friday; Eucharistic Adoration and pro-life Holy Hours in the parishes; and special Masses, novenas, and rosaries throughout the year. An annual Pro-Life Day of Reflection helps renew spirits for our work in saving and affirming life. The ministry also invites "Prayer Warriors" and fasting companions to unite their sacrifices with those of a particular sidewalk counselor. Religious contemplatives, nursing home residents, and all parishioners in the diocese are asked to pray daily and offer sacrifices for all involved in the abortion tragedy, and specifically for its end. Interested in supporting our ministry in personal prayer? 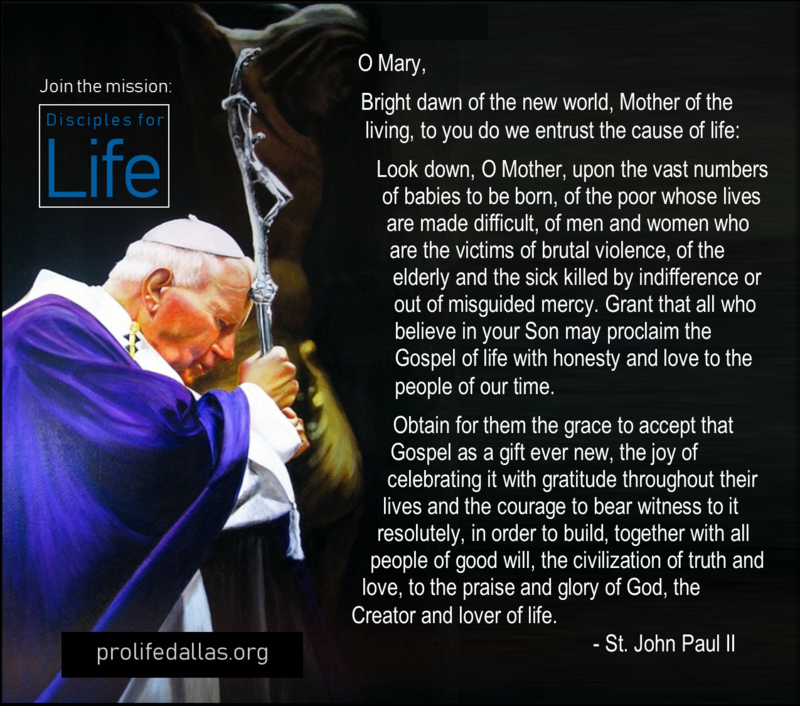 Click here for the Disciples for Life prayer.